Well, not much happened to write about on our first full day (Wednesday) at Rainbow Plantation – it rained. Good day to focus on those not so favorite chores – cleaning the interior of the beast (me) and preparing our taxes (Rob). Not a fun day for either of us! But better to be inside on a lousy day than when the weather is bright and sunny outside. 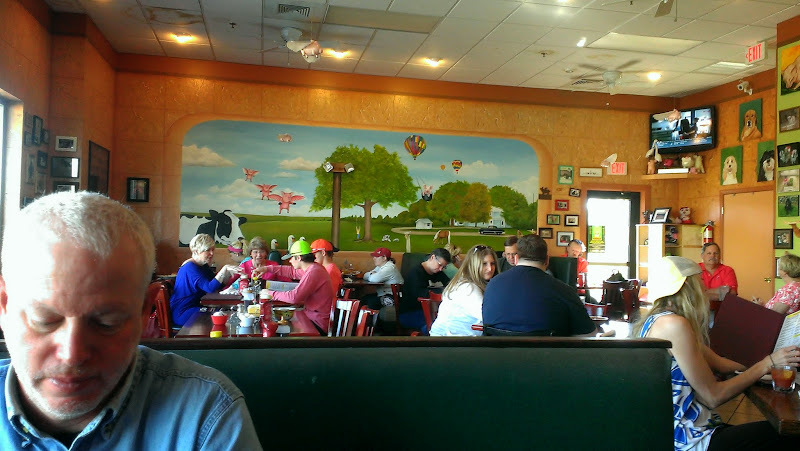 And the next day we were in fact rewarded with bright sunny skies, so we decided to take a ride over to one of our favorite little towns in the area, Fairhope and revisit (we were there back in 2012) one of our favorite lunch spots, Panini Pete’s. 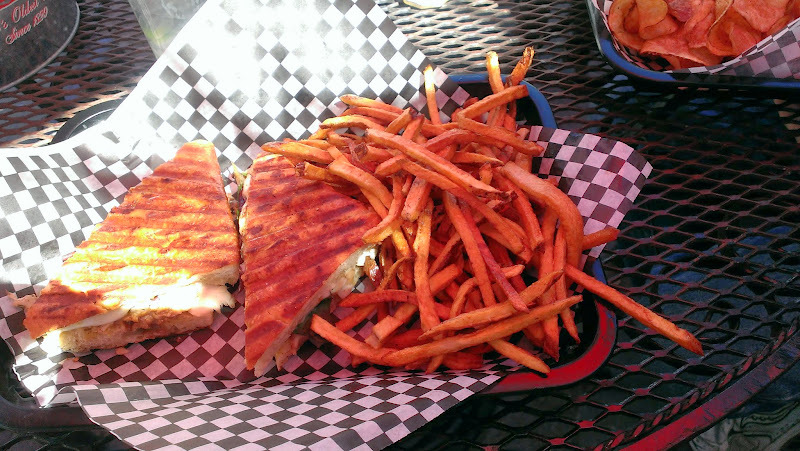 Panini Pete’s has been featured on Guy Fieri’s Diners, Drive-Ins and Dives show and Pete’s infamous Muffaletta sandwich is on the list of “100 Dishes to Eat in Alabama Before You Die List” in the Birmingham News. Although it was relatively late (lunch ends at 1:30 pm) when we arrived around 1:15 pm, we still had a very brief wait for a table, maybe about 5 minutes. It was a little chilly but we opted to sit outside in the courtyard anyway. 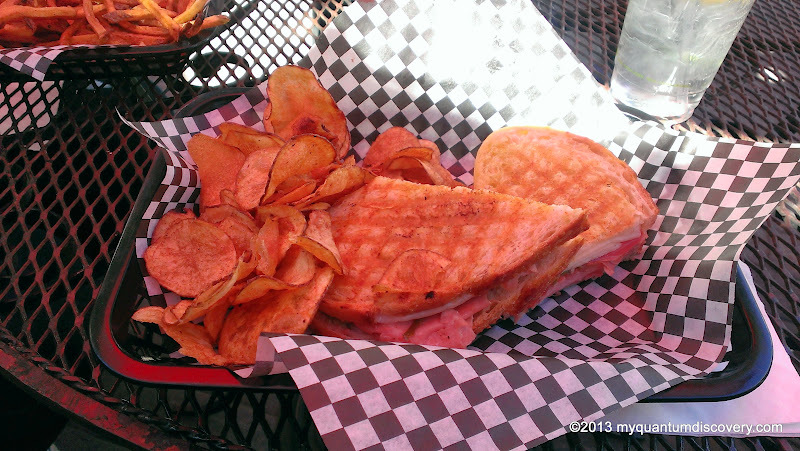 It didn’t take long for us to decide – we ended up having the same thing that we had back in 2012 which was the house roasted turkey panini (baby greens, roasted pepper, Dijon, garlic aioli and their house-made mozzarella served on fresh baked foccacia) with hand cut french fries while Rob had the Muffaletta (Italian meats and cheeses with olive salad on rustic Italian) with home made chips. When our order arrived, we each swapped 1/2 of our sandwich and 1/2 of our fries/chips. Delish as usual! It actually seemed better than it did in 2012. While sitting there, we heard our waitress talking to another couple at a table near us. 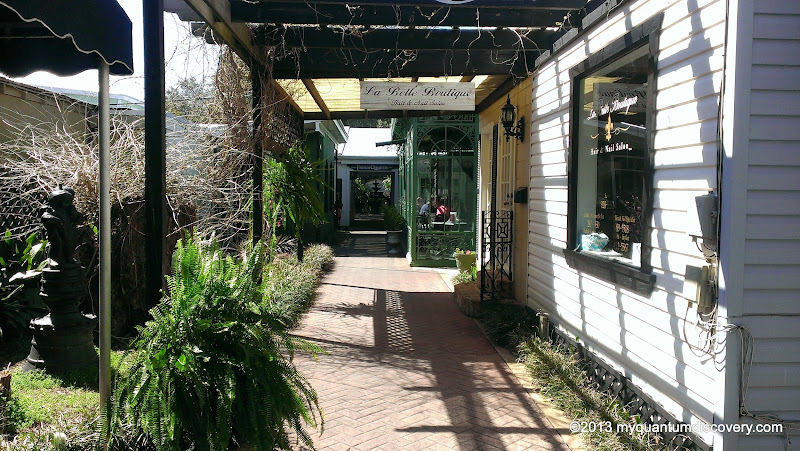 Apparently, Pete is opening a new restaurant scheduled to open this summer at the Fly Creek Marina in Fairhope. I believe she said it was going to be called the Sunset Grill but I’m not totally positive about that. It won’t be another panini joint but will feature an “American blend of dishes with an oyster bar”. Guess where we’ll be eating next year if we’re back in the area! After lunch, we drove down to the waterfront but it was chilly and quite windy with big waves rolling across Mobile Bay, so we opted to stay in the car. We headed back to the hacienda where we took a quick bike ride around the park and then settled in for a quiet evening. 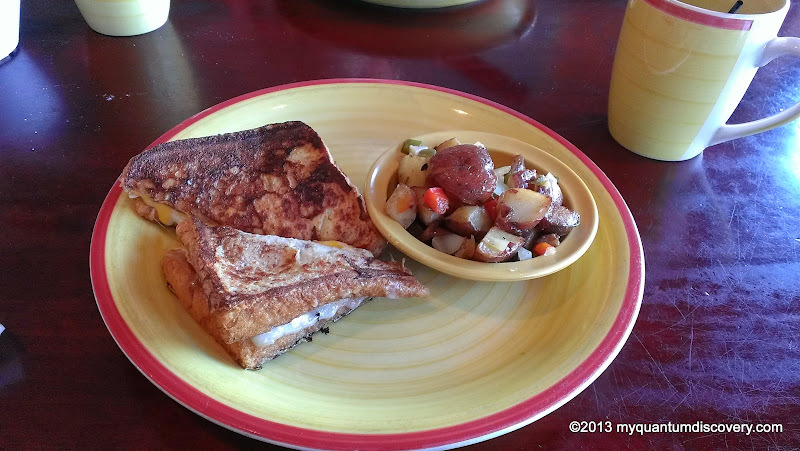 On Friday, the 14th, we needed to stock up on supplies so we headed towards Foley, stopping at Kitty’s Kafe for breakfast. This was another revisit – we had been here before on previous trips to the area. 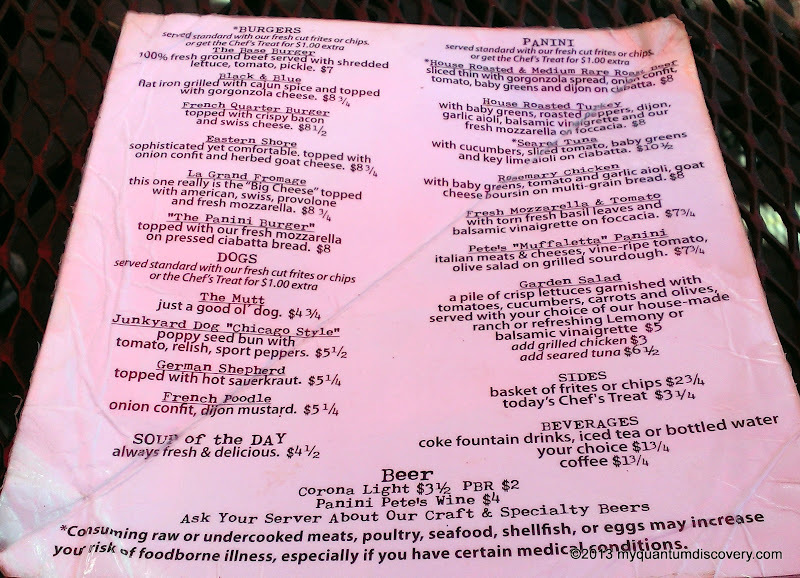 I had Eggs Benedict (1/2 order) and Rob had Kitty’s Kristo Sandwich (egg and cheese on French toast). Delish! Since we were considering traveling to San Antonio, TX at some point in time on this trip, I had been in touch with a couple, Pam and Roy, from TX about places to stay and things to do. We met them while staying at Heritage Motorcoach Resort in Orange Beach in February of 2011. 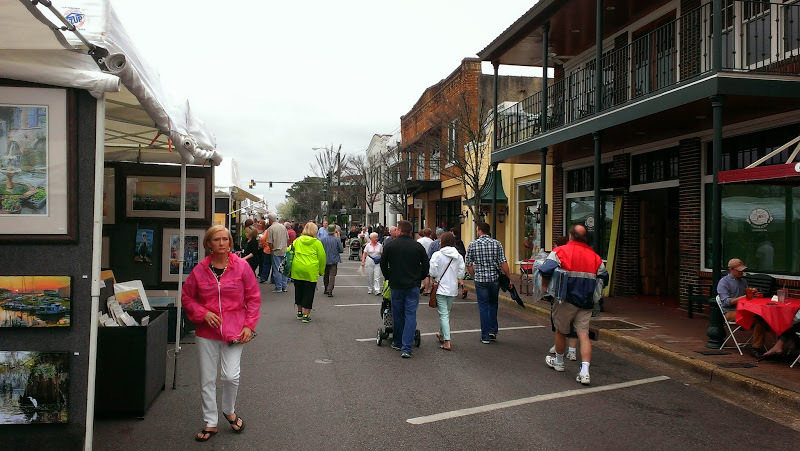 Pam and Roy were passing through Orange Beach (again staying at Heritage) on their way to the FMCA rally in Perry, GA. Pam called us on Thursday night to see if we were interested in going to the Fairhope Arts & Crafts fair on Friday with them. Since we had been there and done that on our last trip, we decided to pass, but we invited them to stop by after the fair which they did. We had such fun with them and invited them to stay for burgers for supper. Really enjoyed seeing them again and catching up on our lives! Also this was the first time we attempted to seat four people at our two person dinette – with a couple of folding chairs it actually works better than expected. Later, after Pam and Roy left, Rob’s aunt Linda sent an email asking if we wanted to go with them to the Arts & Crafts fair on Saturday. Well Pam had raved so enthusiastically about the fair that Rob and I decided that maybe we should go again, so we accepted their invite. 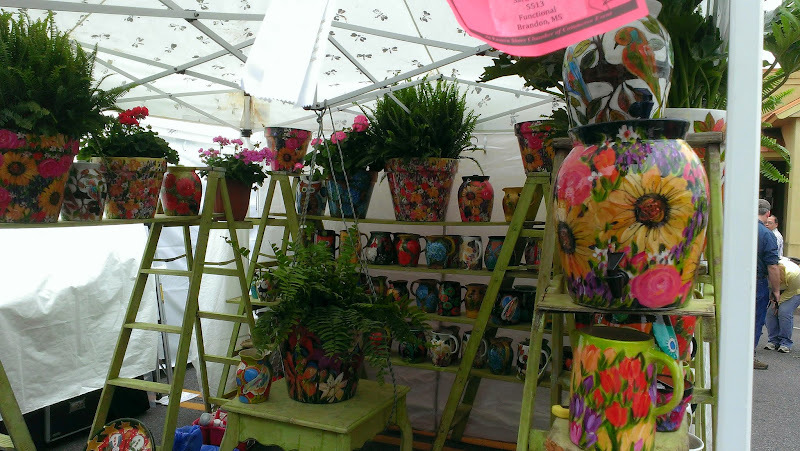 On Saturday morning, Rob and I went to the Coastal Alabama Farmers and Fishermens Market which is a covered farmer’s market in Foley. During the winter months, it is only open on Saturday but three times a week in the summer. It was good but a little disappointing, probably a little too early and too cold for produce here in AL! 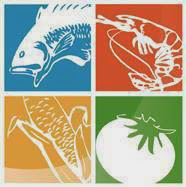 There were a few tables with greens such as cabbage, kale, broccoli and lettuce, a couple of tables with bakery items, a few offerings of seafood (some varieties of fish and small shrimp) but it seemed that almost all of it was frozen, and some handmade items (jewelry, soaps, etc.). It only took us about 15 minutes to look at everything. 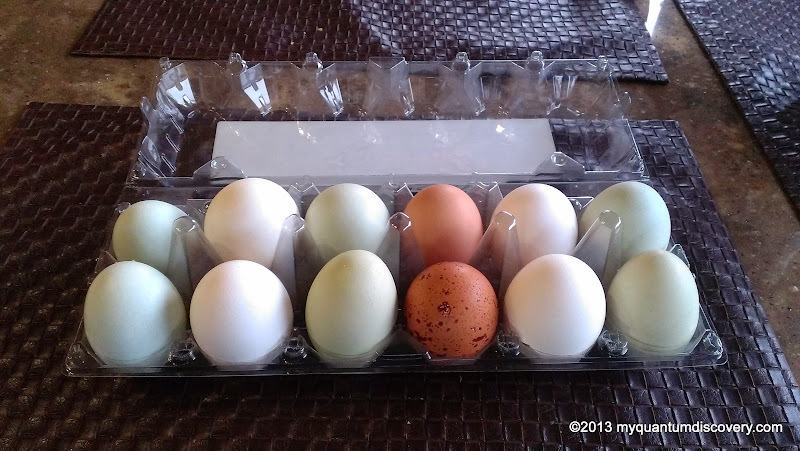 We did end up buying some fresh eggs which piqued our interest because the eggs were several different colors. 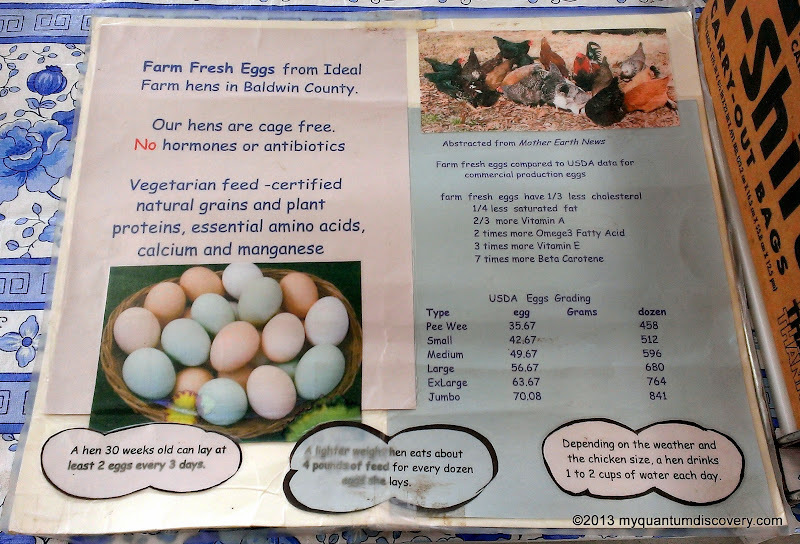 While talking to the owner of Zimlich Ideal Farm, we learned a lot about chickens – who knew that different breeds lay different colored eggs? (white, blue, green, plain brown, brown with speckles, etc.) And that the younger the chicken, the smaller the egg. The point was also made that the weight of his eggs for a given size would be greater than a physically larger commercial egg. 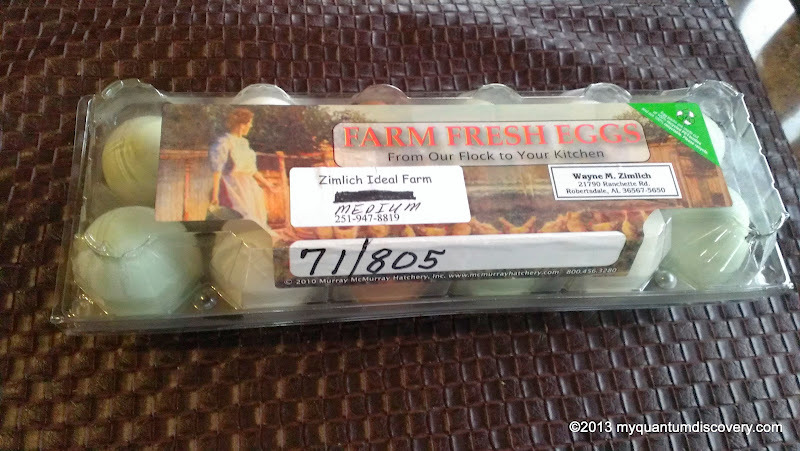 Certainly wouldn’t know that looking at grocery store eggs! He said they would taste better than store bought but we probably wouldn’t be able to tell the difference between the assorted breeds. Maybe we needed to eat a st ore bought egg at the same time as a fresh one to do a real comparison. That afternoon despite the threat of rain, Linda and Herb arrived at our place around 1 pm and off we went to the fair in our van. Last time we went, we didn’t have any trouble parking but it was on the last day of the fair and late in the afternoon. This time, around and around and around we went for about a half hour. Every inch of the town was lined with parked cars. We were about to give up when finally someone pulled out – woo hoo! Boy, was it crowded! 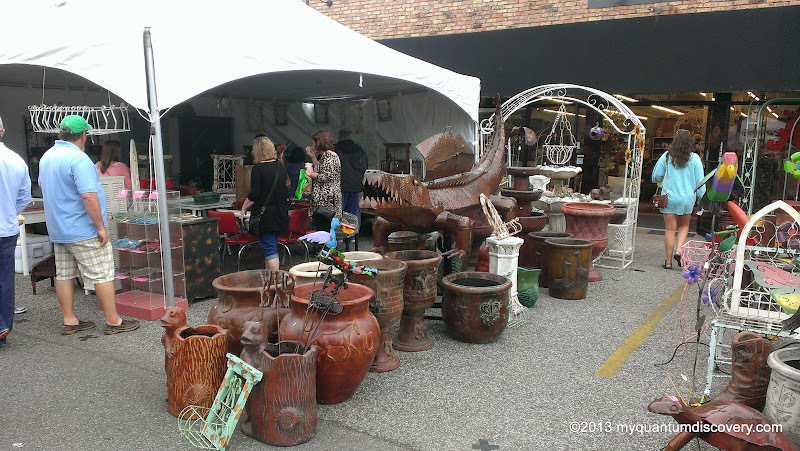 Linda and I strolled ahead looking at all the interesting and hand crafted stuff while the guys lagged behind, totally engrossed in techie stuff and barely noticing anything! Oh well, each to his own! It had started to drizzle but then after about an hour and probably at the furthest possible point from the car, it started to rain. Lightly at first but then turning into a downpour. Yuck! Finally we made it back to the van. Of course by now, everyone was leaving so there were plenty of parking spaces available. 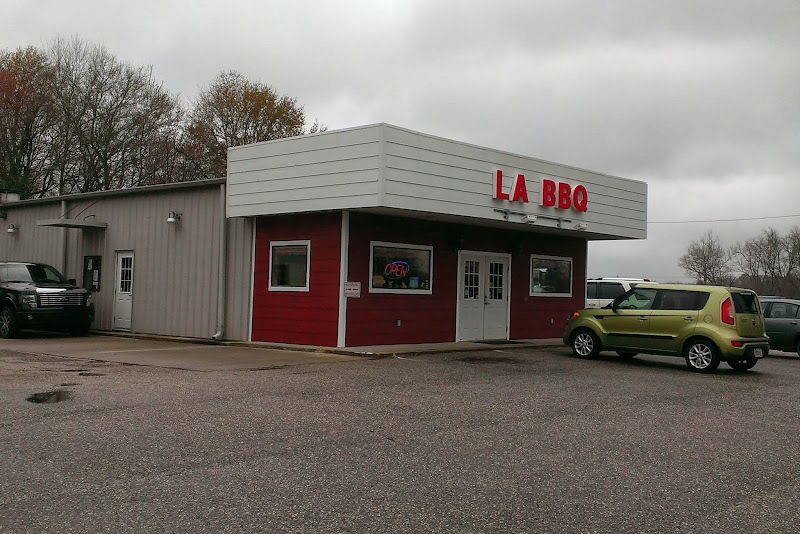 Since it was around 2:30 pm and we were hungry, after a little bit of a discussion we decided to head to LA BBQ on Hwy 59 in Summerdale for lunch. This is one of several favorite restaurants of bloggers, Margery & Paul of Living Our Dream when they stay at Rainbow Plantation. Cute place! At the counter even though it was after the 2 pm cutoff for lunch, we were told that we could s till order from the lunch menu. 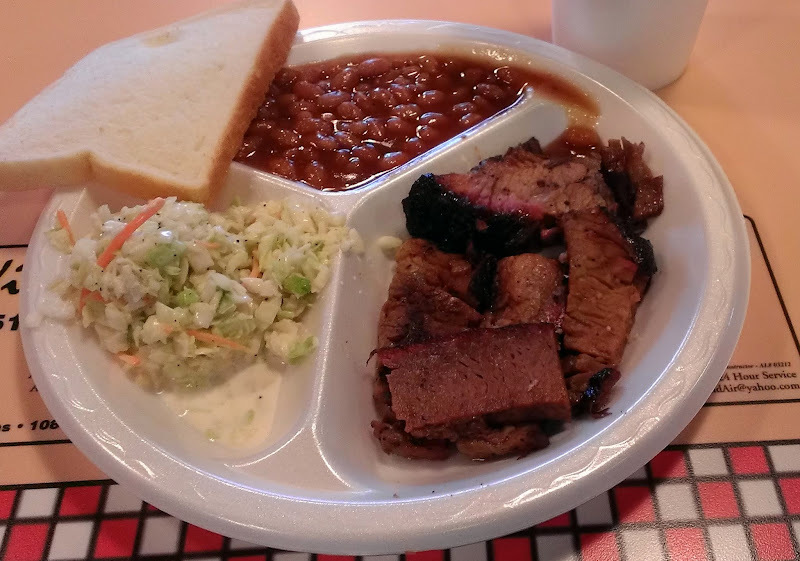 Rob and I both had the beef brisket plate ($7.50 sliced, not chopped) with cole slaw and beans, Linda (aunt) had the chopped pork plate ($5.99) and Herb had the rib plate ($7.99). Really good! Portions were large and quite filling. We’d definitely go back! After we got back to the hacienda, Linda and Herb stayed for a bit. The next day we were leaving Rainbow Plantation to drive a very short distance to our next location. Stay tuned…. Jim and I could pig out at LA BBQ. Looks yummy. Sounds great! 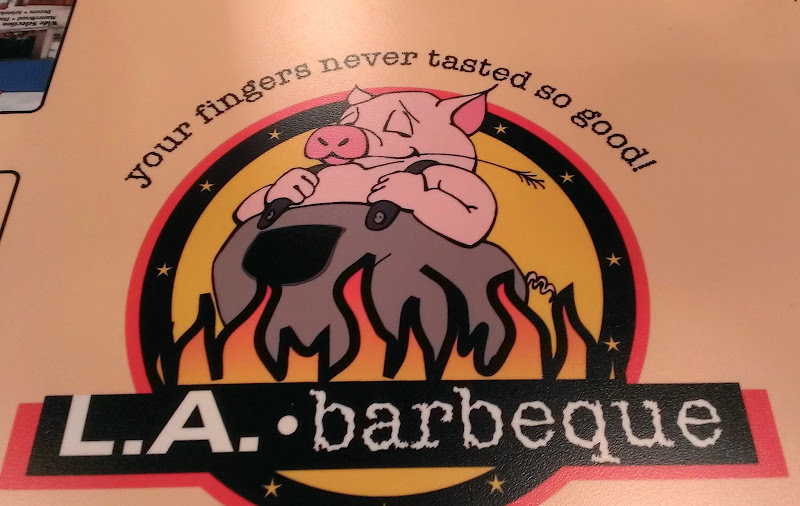 Let us know how Alabama bar-b-que compares to Texas bar-b-que if you end up going to TX.